Ankle sprains: prevent and cure! A sprain is a condition where one or more ligaments become stretched or torn. 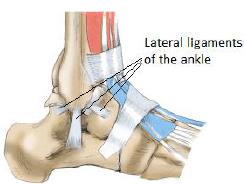 A ligament is a tough band of fibrous tissue, very resistant yet not very flexible, which connects at least two bones within a joint, thus adding stabilization to the articulation (see image on the right). 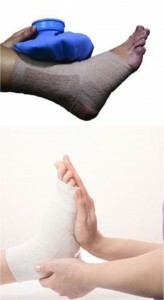 The risk of a sprain is greatest at the ankle. 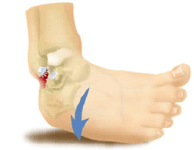 The most common mechanism of injury for an ankle sprain is a stretching of the lateral ligaments of the ankle following a forced plantar flexion (i.e. a pointed foot) and inversion (i.e. a foot turned inward). The main symptoms following an ankle sprain are pain, as well as swelling in most cases. Appearance of bruising around the injury is also possible, as well as a decreased ability to move the joint, and difficulty using the affected leg, such as during walking or standing. A grade 1 sprain is defined by a mild sprain, where there has been a slight stretching of the ligaments but without any tearing of the fibers. The swelling is minimal or non-existent and there is little difficulty in moving the ankle or in being able to walk without a limp. A grade 2 sprain is defined by a moderate sprain i.e. not only theligamentsare stretchedbutthere is alsoa partial tearof some of the fibers. The swellingis moderate andthere may bethe presence ofa bruise or discoloration. It is difficult tomovethe ankleorput weighton itwithout aggravatingthe pain. A grade 3 sprain is defined by a severe sprain, i.e. a complete tear of all the ligament’s fibers. There is an important amount of swelling which follows, as well as the frequent presence of discoloration or At this point, it is very difficult for the injured person to move the joint, let alone take a few steps with the injured foot. For grade I and II ankle sprains, the first objective is to reduce the pain, inflammation and eodema (for grade III injuries, however, the treatment is often less standardized and severe cases may even require surgery). In the first 24 to 48 hours, the treatment thus begins witha period of rest with immobilization, compression, elevation and application of ice (20 minutes every 2 hours) to the injured part of the foot. Electrotherapy modalities (such as ultrasound) will also be usedto further reduce inflammation. Then, a taping or brace may also be used to increase the stabilization of the ankle and protect the ankle ligaments during the healing period. Once the inflammation subsides and once new fibers have been created and solidified, stretching exercises may begin. Your physiotherapist will also use a wide array of manual therapy and myofascial release techniques to increase mobility of the ankle. Then, strengthening exercises for the muscles of the ankle will be added to the program in order to maximize the strength and stability of the ankle and thus prevent any subsequent injuries. If this condition is not properly taken care of early, chronic instability can develop at the ankle, which can then quickly lead to degenerative changes such as osteoarthritis.